I love Club House spices especially the Roasted Garlic & Peppers. I have about 2 shakes and it will be all gone! 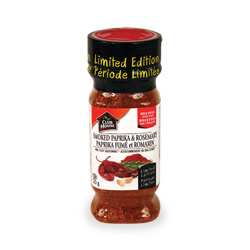 I am very happy to see two new Save.ca coupons for Club House spices. Buy two One Step Seasonings and save $2.00 or try out the La Grille and save $1.00. Just a reminder if is the end of August, time to use up any coupons that may be expiring today!